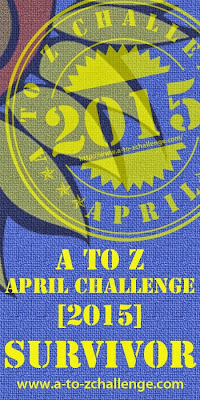 What did you learn from the A to Z Blog Challenge this year? A theme is de rigueur for me. I'm not French, but I love Paris and many things that are of French origin. With a theme, the passion you have for what you're writing about comes through, whether it's your own life, vignettes, or subject matter. De rigueur = strictly required by etiquette, usage or fashion. Romancing the subject - or searching for connections with any given theme via research adds depth to the posts. Add extra information like side dishes to make the reader go 'hmmm - I never knew that or thought of it that way'. For the 'planner' that I am, prepping posts beforehand with research material and images and ensuring I have a subject for each letter is something I do. Why? Life intervenes at the most inconvenient times and pre-scheduling alleviates that. The challenge is to produce a post a day, not just to see if you can fly by the seat of your pants, unless you are a pantser at heart and enjoy doing the flying style. It's a choice. Search for those blogs that appeal and follow those that you like. Good advice because we each have different interests that appeal to us when we look for blog to read. It's a good way to meet bloggers you haven't discovered yet. This month long challenge is like a boot camp for blogging. Expand your horizons, and make the post interesting to others. It's discovery, a way to grow in your writing, and a way to learn something too. Each year I've kept the posts in a collection, since the theme helps with that and afterwards, added a tab at the top of my blog. Most of those posts continue to bring in readers long after the challenge is over. Entertainment. Some of my favourite blogging themes entertained me all month - one on all things Cornish, one with alpha lists of a combo nature-books, movies, and bloggers, one on retro TV shows, one with alphabetical themed vignettes, and one naming all sorts of disasters. I discovered a few new blogs and lost a bit of sleep. I'll look for your Reflections post, if you decide to post one. Previous collections: Paris, Etc, 2012; Art A to Z 2014, and now I'll add a French Faves 2015 (the Archives on this page also shows A to Z posts for April in the sidebar). I'm happy with what I have produced, and I've enjoyed the trip through the month of April. Thanks to all those who formed the Hosting Team! Lee (Arlee), all the co-hosts, ambassadors, teams, and Congrats to all participants! I plan to keep strolling through the list to see those I missed during the hectic times. I've got my survivor badge. Remember there are T-shirts and a Reflections badge too! Check at the A to Z site. Are you doing a Reflections post? Did you enjoy the Challenge this year? Please leave a comment and let me know you were here. I'll respond. Thanks for stopping by! It was exhausting, but I always enjoy it. Six Challenges under the belt now. And if that combo theme was mine, glad you enjoyed it. You guessed it, Alex! You reminded me of books and movies from my past and kept me entertained as usual! 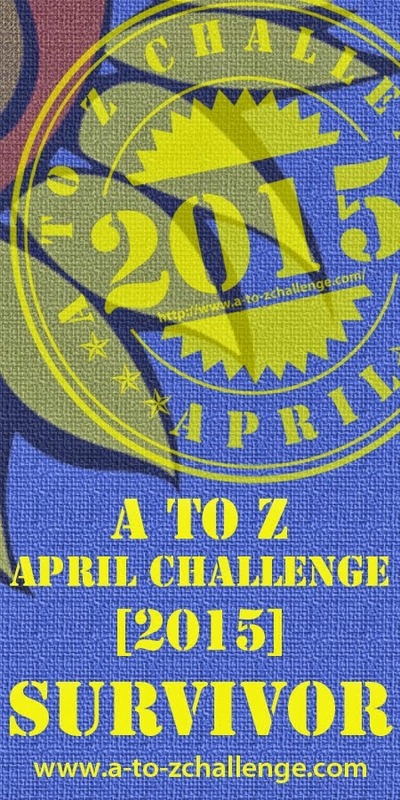 Congrats on finishing your 6th A to Z Blog Challenge! You're welcome. Keep playing that banjo, Steve Martin does too. Good luck dealing with that pesky N key problem. I don't recall you saying how the conference went?? Stay well, Roland, we need the wise words. I enjoyed your posts.. makes me want to give France and Paris a second chance. Thanks so much JoJo, and if I can convince you, that makes me happy. I enjoyed your theme and posts, Paris is a favourite. Boot camp for blogging is spot on! Will be back later on to read the ones I missed. That would please me greatly, Nila. I hope to read more of your posts too. You have a certain way with your writing. . .that makes me smile. Planning is a must for me too. I loved your posts, and I am determined to go to Paris sooner rather than later. I have wonderful daydreams of sitting in those tiny cafes, writing. Several people have mentioned the Cornish entries, and I'm sure Hilary is very happy that her posts were so well received - she puts so much effort into them. Her normal posts are exactly the same! Yeah, another planner! September is a good time to visit, fewer crowds and lineups, easier to get into cafes and bistros, and the locals seem friendlier. Our next trip planned for when hubs is better, will be in spring - you know April in Paris, or maybe May. . .May seems ok so far. . . Thanks for sharing all your travels and insights into the lovely city of Paris! You would think everything has been said about Paris, but every person's perception is different. Some look for glamour, some travellers look for 5 star restaurants, we Iooked for history, Parisian cafes, and the beauty of the city, including its monuments. The people with a few exceptions (and that happens anywhere) were generous, helpful and friendly. I really try to be careful, and don't want to hurt anybodys feelings, but you A to Z Challenge this year was my all time favorite. The photography is superb and you theme was fun and informative. I think I read every post. I may have missed commenting on one or two, but even when I was 'late' I backtracked and read them all. I really hope you had as much fun putting these together as I had reading them. It's obvious, with all the links you added that this was a ton of work, but for my money, worth it. You've made my day, FAE! I am so glad that you enjoyed it, as I enjoy your BOTBs and the background on why you choose certain songs. The photography is another passion of mine, so I'm always happy when others like the images! I debated whether to join in this year, but I wanted to make up for all the time I haven't been posting in the last few months. I hope you continue to drop in now and then. . .your comments are appreciated. You did so well, D.G. When you write to your passions, it shows, and I certainly get your passion for Paris. I've enjoyed reading some of your posts. When time permits, or I need a Paris fix, I will come by and read more! Please do come back Denise, to read more! You'll always find something about Paris here.I appreciate the kind words. Put the previous comment in the wrong reply box. Oops. I did enjoy the challenge this year, but I stressed out on the first year. I need a theme and advance time to enjoy the posting every day process. I was away for most of the challenge so didn't participate but I did check out a few before leaving and they were fun. I'm hoping to do it next year - unless I'm fortunate enough to get back to Sanibel. In which case beach trumps alphabet. I skipped a year in 2013 so I've only done three of the alphabet runs. If I have a theme and time, I'll probably do it again. A vacation would trump a blogging challenge with me too. I'm glad you didn't suffer any side effects. That Paris Syndrome is rather strange. It probably comes from travelling in large groups and trying to see everything in a short period of time. . . Sounds like you had a great time and that there were some awesome themes. That sums it up, Mary! Good luck with your latest release. I like your Backworlds universe, and wish I had more time for reading now. And for writing. Hi DG - thanks for the Cornish mention - sorry I'm way behind ... trying to do too much and garnering a bug. I'm wandering through now .. I love the Paris themes you've given us - a great opportunity to see Paris and then I have a reference tool to link back, when I eventually get over the Channel for a visit. Hope you feel better soon, Hilary. Thanks for your kind words. I wish I lived just a Channel away from Paris. . .